This MP3 player accessories guide includes cases, cars accessories, ipod docking stations, headphones, alarm docks, as well as a shopping checklist, jargon buster and FAQs. MP3 players are one of the most popular electronic gadgets of our time, especially for music aficionados. From the famous Apple iPod to the Sony Walkman and everything in between, MP3 players have a wealth of accessories available for them. Whether you are looking for speaker dock systems, headphones, alarm docks, cases, sport accessories or car chargers, we'll help you choose the best MP3 player and iPod accessories currently available on the market. Cases The first accessory you will want to purchase — and one of the most important — is a case for your MP3 player. In addition to offering protection from scratches, drops and general wear and tear, a case will often change the appearance of your MP3 player. Many cases offer further functions such as a way to prop the player up to watch videos more comfortably or an armband to store your player while exercising. Some will even charge your MP3 player with a built-in, secondary battery. 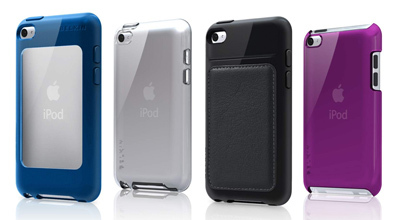 The most important factor when choosing a case is protection — basic silicone cases do a reasonable job, but leather cases, hard shell plastic or metal cases may provide greater peace of mind while also giving your MP3 player or iPod a distinct look and feel. Some cases may offer a lifetime warranty, and you should look for material that is slip resistant — if it is possible, try to feel the case before you purchase. Also consider where and when you will be using your player before deciding on a case. Headphones Although the headphones that come in the box with iPods and other MP3 players suit many users just fine, a new pair of headphones will enhance your music listening experience and allow you to hear more elements of your tracks. In addition, many headphones like the Phitek Blackbox M14s offer a noise-cancelling feature: ideal for blocking out those pesky schoolkids on public transport, or minimising aircraft noise when flying. Purchasing portable headphones is difficult as you often won't be able to try before you buy due to hygiene reasons; the best thing to do is to read online reviews of particular models. A new set of headphones can set you back anywhere between $20 and $600, depending on the quality and type. For wearing headphones on the move, you may want to choose smaller cups (an over-the-ear design), an around-the-ear design or a pair of in-ear monitors (IEMs). IMEs are similar to earbuds, resting inside your ear rather than on top of it; however, they go one step further and actually sit inside your ear canal. This can be a little uncomfortable for first-time users, but once you get the hang of them, IEMs like the Logitech Ultimate Ears 700, provide excellent sound quality and isolate you very well from external noise. Finally, noise-cancelling headphones are designed for use in places with significant ambient noise (such as aeroplanes). These are generally lightweight and compact, but can often be fragile, so check that they come with a protective bag or case. Aside from sound quality, the most important factor to consider when buying headphones is how comfortable they are to wear, especially if you listen to music for long periods. Check out our "Best high-end headphones round up" for help in choosing the right pair for you. Speaker dock systems If you own an iPod or any other portable music player and want to play your tunes to a wider audience, a speaker dock would be a wise investment. These portable speaker systems come in a range of shapes and sizes and can be ideal for multiple uses, including travel, as an alarm clock or as a stereo in the bedroom. Before buying a speaker system, it's best to stop and think about what its primary use will be. Are you a frequent traveller? Will you be mainly using it at home? Or do you want a solution for your car? It's important to answer these questions in order to make the right purchasing decision. Check out our "Best iPod docks round up" for help in choosing the right one for you. If you're looking for a travel solution, there is a wide range of compact speaker systems available that often fold up small enough to fit comfortably in a suitcase, or to throw in a bag for a day at the beach. If you aren't a frequent flyer and want a speaker system mainly for home use, there are plenty of options. 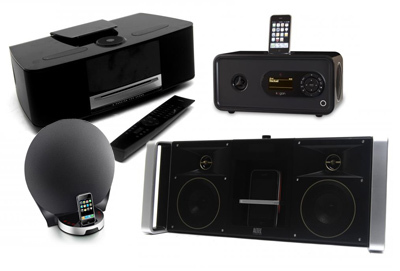 Some of the larger systems are ideal as a second stereo system or for parties. Some systems include extra features, such as the ability to use your MP3 player as an alarm clock. These larger systems usually run solely off AC power, though some of them may be powered by one or more rechargeable or replaceable batteries. Most of these speaker systems are designed with the iPod in mind, but many of them also feature a regular auxiliary connection; this means they can also be used with any MP3 player with a standard headphone jack. Car accessories If you store most of your music collection on your MP3 player or iPod, there is a wealth of car accessories available to play your tracks while you're on the road. One of the cheapest solutions is an FM transmitter like the Belkin TuneBase FM w/ClearScan. These small devices allow you to wirelessly stream music from your iPod or MP3 player to your car stereo via FM transmission. Although sound quality isn't the best, this is a reasonably priced way to ensure you can take your songs with you on the road. There are a lot of models available for all MP3 players, so be sure to check that your model is compatible before you purchase the device. 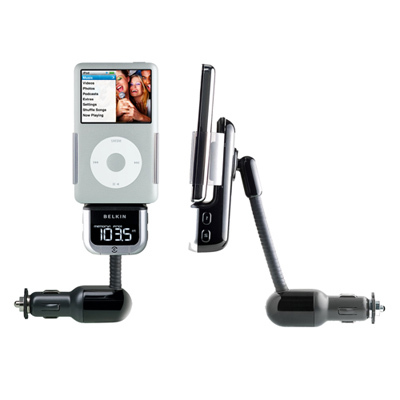 In addition, a range of cradles and mounts will store your MP3 player in the car while driving. You can also purchase in-car chargers for MP3 players. These plug into your car's cigarette lighter. Cables Your MP3 player or iPod can be used with a range of cable accessories, from a standard stereo cable to allow connection to an auxiliary input port, to a Y adapter cable that allows you to connect to portable speakers, sound cards or home-stereo devices that have RCA jacks. 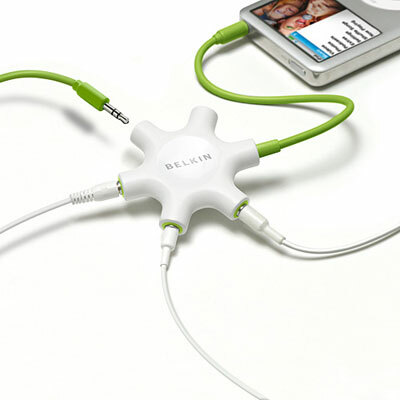 Other cable accessories include a splitter that can allow several people to listen to your music simultaneously, an accessory that could be ideal for travelling.